So, you’re a beginner or intermediate user of Excel and searching for the best Excel books that will take you to somewhere from nowhere. Truly speaking, I was at your stage some years ago! I did know very little about Excel even in 2013. I badly needed a tool for my stock data analysis. I wanted to make some models and found that finance people are using Excel extensively. I’ve heard about Excel but never used it or I was not in a position to take this tool seriously. I’m a programmer (know already lots of languages), so thought the hard way to make a system for my data analysis. Talked to some finance people and they suggested me to use Excel. I started using Excel and I’m still unfolding the true power of this huge tool. Let’s make the long story short and give you the list of books that you should start with. Are you a very beginner and you know nothing about Excel? Started a job and your office needs Excel tool at your skill box? OK! 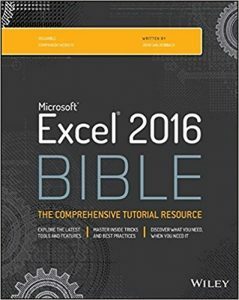 Start with the series of Excel bibles (Excel 2016 version). John Walkenbach, the author of Bible Series, will introduce you to every feature of Excel (in step by step way) with lots of tips, shortcuts, and practical uses of the features. The books provide the working files (downloadable from online). So, if you’re a very beginner user of Excel, start with an Excel Bible book. OK. If you’re already introduced with Excel and know lots of general how-to features, then I will rate you as an intermediate Excel user. Choose these books for your reference. So, start with any of the above books, you will not regret. If you’ve any question or suggestion, please put it in the comment box below.